This is Arsenal third Signing of the Summer, after signing Wolfsburg Player For €60 million. Arsenal third signing of the summer is a defender. This will definitely add to their ranks. Although the new arrival is not one who will make the fans scream, like them did when Wolfsburg Player was signed last week. The Gunners have reportedly signed English defender Rob Holding of Bolton Wanderers for a fee believed to be in the region of £2 million. The signing of this 20-year-old who has only made 30 first team appearances for Bolton will make supporters wonder if their manager will ever change his approach to transfer activities. At a time when the club is desperately in need of a strong wall at the back, Arsene Wenger has successfully brought in a semi-experienced kid. 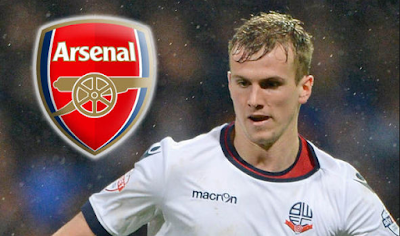 He (Rob Holding) has been with Bolton since the age of seven and he made his first team debut back in August in a Capital One Cup tie. He (Rob Holding) is versatile as he can play both in full back and centre back. He was voted Player of the Year at Bolton at the end of last season. Yes, Rob Holding is a nice player at his level but he is not that kind who should be seen as a saviour in the first team. He is one for the future.